Do you work for Heap? Learning about Heap? We can help. Instant, retroactive analytics for web and iOS. No code required. "Solved all our analytics problems"
The dashboard is user-friendly and offers all of our insights in one place. We didn't have to wait days for data like we did with Google Analytics we started seeing data within an hour of installing it on our site. How hard it is to manage different sites our tracking code is installed on. I wish this would improve. We are solving our data analytics problems and learning how customers use our site better and quicker with the data collected. We have been able to determine which products to launch and which ones to discontinue. It has also helped us design our site better around how users use our site and services. "A Better Way for Non-Data Scientists to use Abalytics Data to Answer Business Questions"
Heap is easy to implement, easy to use, and very simple to deploy. It gives the "lay-person", a marketing team member, or business team member who is NOT a tech savvy data scientist the ability to review the most important data, answer questions in a meaningful way that allow meaningful and clear decisions to be made based on data. We only recently started using Heap, in conjunction with Google Analytics, and so far there is nothing we've encountered that I dislike. The trial is not hard to implement or deploy. At the least Heap is well worth the try to see if it's a better solution that enables more informed, data-driven decsions. The ,main objective in the trial and adoption of Heap was to allow anyone on our team from accounting to sales to business development and HR to easily utilize the data platform to extract relevant and useful insights applicable to their parts of the business, and do so without having to pull people from our tech support, IT, or marketing analyst roles in order to do so. Heap has made this a much more viable process and has saved us a few dozens of hours in people hours over the last 2-3 weeks alone. Additionally, we can be more confident of the decisions we're making about driving the business because we have a clearer picture of our data. "It's how we make decisions"
How granular and specific you can be with your tracking. We can tell exactly how our customers are using the platform based on what they do, not just what they say. Approachability - for more technical users, such as our product team, it's relatively simple to dig into and start culling insights from immediately. For other, less savvy business users (marketing, customer success) there may be a learning curve. Heap is critical for us to both understand the usage of new platform features, as well as to strategize on aspects of the platform we need to improve. With every product decision we make we now back it with data, it allows us to validate or reject our hypotheses with concrete feedback. El programa proporciona las herramientas adecuadas para que la gestion de usuarios y clientes sea muy sencilla. Heap cuenta con la opción de comparar análisis entre diferentes usuarios de forma automática. Se puede ampliar la base de datos para tener más información sobre los clientes así como crear informes personalizados y almacenarlos. El soporte técnico a veces es demasiado lento y no responde a todas mis dudas. La configuración de este programa es costosa y lenta, con una interfaz poco optimizada. En algunas ocasiones el análisis puede llegar a tardar mucho tiempo en realizarse. Programa ideal para grandes y pequeñas empresas con el que se puede realizar un seguimiento personalizado de cada usuario o cliente y con la posibilidad de hacer comparaciones. Hacer análisis y seguimiento de usuarios y clientes con el software de escritorio y la aplicación para móviles con diversas configuraciones que permiten realizar las acciones de forma muy sencilla. "Easy Integration with Lasting Benefits"
Heap enables one to easily track how customers use one's applications on both the web and mobile. This data is crucial to informing product development and further enhancements. With its ability to easily define user events, one can easily detect how one can better optimize one's product to drive better retention and feature use. Their analytics could be more user-friendly and ML could be used to give proactive feedback on user activities. This isn't crucial but would be immensely valuable. This product is certain to deliver valuable data regardless of how deeply you integrate it. Also, if you have investors or managers constantly requesting user metric data, this is an easy way to simplify the gathering and distribution of such information. Discerning application and UX weak points, and driving better user retention. Another immensely useful feature is the retention graphs with the ability to even generate retention data for individual features. This reporting has helped improve investor relations and let us quantify our growth and progress with ease. "Best analytics tool out there"
Once upon a time, there were a few names trying to compete in the analytics market; then came Heap and changed everything. They figured out a way to track all the events on your web page without you telling them what to track. That's a game changer. Track first, build your funnel later. I guess one of the few things I would improve is to be able to create an event for a button based on the route that link was clicked in. It's a no-brainer. Even if you already use another tool, give Heap the chance and implement it along your current analytics tool. It will help a lot. It's been definitely helpful for improving my funnel. By running experiments I've been able to tweak some texts and button placements and see how they influence the conversion rate. Heap helps when trying to really dig into user behaviour. It allows for multiple actions, views, clicks, etc. to be grouped and filtered. I especially like the ability to have specific filters to know more about our prospects. Sometimes the data gets funny and we always have to tweak it to get to the final numbers. The best way to get about this is to look across multiple data sources and have a fact check on each and every number you get. Once you find out that things are almost the same, then you can start to relay on it completely. Before, that, it's best to double check the numbers. I would recommend Heap, just make sure of the price-value for you. I've used several analytics platforms in the past, and Heap has by far made my job the easiest. I love their structured query builders and the insights and ideas you get from the builders themselves. As someone who is not super data savvy, this is a god send. Analytics were a frightening beast before I had the chance to use Heap. If I don't have an available dev on hand and the event that I need to track is fairly simple, by using the visualizer I can create it myself. I also can't thank their customer success team enough. Super responsive and will help you get to the answers you need to make the best product decisions. I really get frustrated that I can't see a set of reports altogether at once, e.g. a dashboard. It makes it hard to tell a whole story rather than piecing each report one by one. I primarily use heap to make decisions around our web product offering, including 1. should something be deprecated? 2. should something be built? 3. did we build this right? 4. are people using it? 5. should we intervene? I have realized that data doesn't have to be scary. The custom reports, and the historical views of the data. How I can run and compare reports over time (days weeks months) in one place. I also dislike how easily it is to pull inaccurate information if your report isn't properly defined in many different categories - it's very easy to pull and analyze highly skewed data. I also had an unpleasant experience with a customer support call in the past, where I was told to "Put a pin in it" at one point. I did, however, have an incredibly pleasant and helpful experience with someone new after that and he helped me out for weeks and really enhanced the accuracy of my reporting. Our tech platform is valued at 30% compared to our email service, yet we have invested so much in created the platform. Many users are unaware it exists and are pleased to just receive the emails since they contain so much valuable information. We want to understand what our users value on the site, how to compare it all and where our deficiencies stand. "Effective and simple to use - great UX"
The ability to label anything you want manually is the biggest plus. Typically having to go to the developers asking them to add an item to track in the code is time consuming and restrictive. The ability to find out almost anything I want in Heap by labelling buttons, clicks and page views is amazing and a "why didn't I think of that" idea. The simplicity of the user interface is also great and allows you to slice and dice the original data in a smart way. There is no analytics platform that is perfect, so it is harsh criticism but it can't do everything easily. Some actions still need to be added in as custom, anything that isn't fixed e.g. profile completion. I have also found some things easier to report elsewhere e.g. Source I find easier from google analytics. I am being picky here though! If you have a basic Wordpress site you may not need Heap and could afford to stick with something like Google Analytics to get broad trends. However you would still be foolish not to as it can help you make more detailed analysis and will future-proof you if you do grow. If you already have a complex system similar to ours, I would highly recommend it! Heap allows us to be pro-active in our analytics measurement. We are a recruitment and learning platform so there are a lot of variables to keep in mind. If for example a job isn't receiving many applications you want to know whether it is because the opening tile isn't appealing enough, the job title isn't right, the description of the job, placement of the button or something else. Heap allows you to become an investigator and label items such as "clicked on the tile" "viewed the page" "clicked apply" and get a sense of where the drop-out is using these 3 as a funnel. Combining Heap with a tool like Lucky Orange which is a cheap way to video/track your users you can get a real sense of where and why users are dropping off. With this information you can then make recommendations to your clients or tweaks to your product. It is extremely valuable. "HEAP truley delivers and brings great depth of analysis and value to our company." The ability to easily bring in data points from other systems using HEAP's API is invaluable to our organization. We can see and interact with data further down the Sales funnel which no other analytics tool has been able to do. Retroactive reporting allows us to focus on delivering the best experience to our users, instead of having to think of every possible reporting scenario and making code changes to achieve them. One of the few things I think HEAP could do better is organizing saved reports, and more reports could give aggregate numbers of the values being shown. Think long and hard about how much coding and planning would go into another product to achieve what HEAP delivers day one. We wanted to look at user interactions based on data beyond a simple form conversion. Through intergrations with our CRM and other tools, we can slice up web visitors in many ways further down the Sales funnel. "Such clear product engagement and marketing conversion insight"
The ability to pull funnel reports in 60 seconds. Before Heap, we were using Google Analytics and creating custom reports. I like how intuitive Heap is; now, without having to rely on someone more tech-savvy to go in and set up a custom report, as I had to do with google analytics, I can go in myself and create reports without a problem. In today's day and age when marketing teams are pressured more and more to prove ROI with each and every campaign, tools like Heap are invaluable. The fact that they're easy to use makes our entire team hands on with pulling reports for different tracks within marketing: content, events, etc. Easily sharing reports within your team. I wish there was an email share or send to slack integration. It'd also be cool to have a knowledge base or free events where Heap experts on teams like ours (marketing) walk through tips and tricks for setting up reports to prove ROI. Put in the effort up front to get yourself familiar with the tabs and user properties, because this is a tool you're find yourself using multiple times a day, every day. Proving that blog content ties to revenue through trial to paid conversions. Also investigating product usage to optimize new user onboarding experiences as well as to reduce churn. "Great tool for Product Managers @ startups"
I love how easy it is to setup events. The UI is so easy and intuitive (just click on why you want to track and name it). As a PM, it's been a great tool for me to see how our users are interacting with our web app and to make product decisions based on that. I also love that everything is tracked regardless of whether you've defined an event for it. This means that any even that ou do create, all the data is retroactively added since Heap tracks it all anyway. It's great for growing startups because it's very affordable as well. The learning curve to maximize the benefit of all the data that you're collecting is pretty stew. I'm still learning how to define the segments and run reports off of them. Figuring out how our users are using our web app. The identify API is a plus to uniquely ID who's using the software. "Automatic Event Tracking goes a long way!" Heap's automatic event tracking makes implementing this engagement analytics platform a breeze. Once the scripts are on the site, every data point is recorded and stored on Amazon Redshift so when you add an event at a later date, it retroactively pulls the data from when the script was first placed on the page(s). This is a really powerful feature to have if you forget to add events during the onboarding process. The reporting dashboard could use some improvement on since it's not as intuitive as other platforms. This is probably where Kissmetrics has the upper hand since it's easier to dig deeper in their interface. The automatic event tracking goes a long way but your team needs to be proactive in defining events and make sure that when pages are rebuilt, old events are mapped to new events since these are defined in Heap using CSS Selectors. The Visualizer feature makes it very easy to add events to track, which took forever in Google Analytics because we had to get the tech team involved each time. We are using Heap to figure out which cohorts are staying on longer as subscribers based on their actions pre- and post-login. It's helpful to group together several events to see if there's any correlation to them being long time customers. This obviously helps us determine which types of content may be influencing users more than others and guides us in our CRO efforts. "Easy Implementation, Impossible to Analyze"
By far, the installation and the ability to track all activity retroactively is the key feature for this product. It does mean that once things are up and running, which requires just one line of JS, you are tracking everything. The ability to analyze is ridiculously bad. I've been doing web analytics for four years now, and I'm pretty good at it. I find that usually the third level of drill down is where you start getting an answer to your question, and Heap just doesn't allow enough in depth analysis. It feels like an overall funnel analysis tool, and its reporting is just so incredibly basic. It was essentially useless for analysis and acts almost as a glorified tag manager. It also doesn't actually record form fields very well. Just don't do it. If you can't afford a true enterprise analytics system, stick with Google Analytics. If you can, try damn near anything else. I've been unable to set up what I consider basic reporting. This was an attempt to be able to do more in depth tracking of funnels and product optimization, but it's been bad enough that we're just stripping it out. We were hoping that it would be a suitable, enterprise level replacement for Adobe Analytics, but at the end of the day, it was a disappointment and we decided on Adobe Analytics instead. "The Best Analytics Platform Out There"
I've used many analytics tools for years now. What I like best about Heap is how fast I can build insightful funnel graphs with ease and accuracy. This allows me to do landing page optimization more effectively – delivering better results for my clients. I also use their API for tracking certain custom events that allow me to more effectively measure visitor engagement. Hmm... I'm not really sure. I have yet to find anything I don't really like about Heap. Give it a try! Their Visualizer tool makes tracking events a breeze. Once you get the hang of structuring your account(s), campaigns, combined and singular events, then it's off to the races with funnel optimization (with segmentation). Conversion rate optimization for clients. More conversions. The backend of the product is quite nice. The list view allowing us to drill down and see both custom and raw events per user is very cool. We setup heap, mixpanel, calq, google analytics and sentry to trial various metrics/reporting. They all have similar API/SDK calls but heap ended up being the hardest to integrate by far due to its unnecessarily opinionated JS snippet making it incompatible with tools like the Google Closure compiler in clojurescript. Every other reporting tool supported setting their lib as a dependency in :foreign-libs but because of the very exact way the user ID and order of loading/calling functions in the heap snippet, this was not possible. Early stage startup looking for metrics to help develop product and grow customer base. We setup pirate metrics, but haven't been using the product long enough to get much benefit. "Super powerful for autonomous marketers"
Auto tracking of every single click on the website right out of the box. The ability to retroactively define an event by using a CSS selector or HTML element in order to get instant insights. Price is steep when you want to export data to your own database. Be mindful of the price if you intend to export data to other platforms. Definitely give a try to the FREE version as you only need a few minutes to get started. Install the snippet on your website even if you don't intend to use it. If one day you end up being a paying customer, you will have access to a full history of anything that ever happened on your site from the day you installed the snippet. There is absolutely no setup to do. It's my new favorite software. I am able to dive into front-end data to understand user behavior on the website and I can do this with no help from our dev team since everything is being tracked right out of the box. I use this over Google Analytics for 95% of the questions I need answers for. Retroactive analytics implemented with the visualizer lets Product and Marketing analyze any in-app behavior without using Dev time. Can be tricky to get events defined correctly sometimes, but that might be because of our CSS. Corollary analysis is time consuming. It'd be great to see what events have highest correlation with certain behaviors and then be able to explore those in more detail. Even though you can through Heap out there to track anything and everything retroactively, planning around key events, behaviors, success measurement is key to getting the most out of Heap. "Great tool for understanding user behaviour"
Heap helps me track every step of the customer's journey. I love the events visualizer feature and I also frequently look at our funnels. It's not the easiest to setup and use but at the end of the day, all analytics tools tend to have a learning curve. I definitely recommend it. You can try it for free to see if it's a good fit for your company. Helps us visualize our users' journey and behavior. "Great insights into user behavior"
The reporting builder is easy to use and provides great insights. Also, that when you add a new behavior, you still get the historical insight; you're not restricting to data that occurs only after you've created that event. Some of our buttons and links were difficult to set up (web based) and required a lot of testing to verify that the event was tied to the correct behavior. It would be great if the event tracking (including RAW events) was accessible at the time of event creation so you could create and test an event at the same time. I'm using Heap to track user behavior in my web-based SAAS product. It's been very helping in building reports and challenging my assumptions about user behaviors. The simplicity of this tool is amazing. You can map events on your website without any coding or knowledge of programming. To be honest I haven't found things that I really dislike. It's doing what it suppose to do very well. If you're looking for a tool that helps to measure conversion rates of your customers actions on your website, HeapAnalytics stands out as a simple tool that can do it all. Finding out how many visitors are reaching specific parts of the website and doing events. Conversion ratio measuring with this tool is really simple. "Heap empowers me to make data-driven decisions"
The best part of Heap is the Visualizer, the point-and-click ability to define events and to retrieve data retroactively. At times, you're not always able to get the events you would like using the point-and-click event defining. One scenario is a drop down menu, it's not always consistent there. "In a crowded field, Heap stands out as the analytics platform that truly understands their customers"
Heap is remarkably easy to use. We exposed Heap to a few non-technical business analysts, all with zero prior experience in web analytics. In a matter of weeks, not only had they taught themselves how to use the software, but they were actually discovering valuable, actionable, and impactful insights through Heap. Plenty of software is easy to use; Heap makes it easy to bring value to your business. There is room for improvement surrounding how they communicate their pricing. Right now, the only two pricing options are "Free" and "Contact Us". NHeap is incredibly easy to install, and very easy to get started. They have a free trial, so I would recommend at least giving it a chance. Once you copy and paste the installation code onto your site, that's it - no more coding knowledge required to use the product. Give it a try! In addition to the standard business problems typically addressed by web analytics (conversions, churn, etc), we also wanted to leverage Heap on a single internal product to demonstrate the value of a web analytics capability at an organizational level. In practice, this meant that many of our potential Heap users would have no prior experience with web analytics. Heap's retroactive analysis capabilities gave us a huge advantage here. As we learned new tactics and skills, we were able to immediately apply them in Heap and see their impact over all historical data, not just new data generated after the implementation date. Additionally, since we were leveraging Heap on internal-only tools, these tools had relatively small user numbers. Most web analytics platforms are designed to provide insights at an aggregate level, meaning that the insights are only valuable with large traffic numbers. Heap's user-level insights allowed us to get the same level of intelligence from ten users as we would from ten thousand. Heap gives us the ability to see how our customers are using our iOS app, and our website, with fantastic clarity. Creating filters is very simple and intuitive, as are funnels and reports generally. That it is so much easier to use than Google Analytics. For an all-rounder marketer like me it's such a relief, because I simply have no time to study Google Analytics in depth, i.e. every time I need some data it's like a several-hours ordeal. I haven't been using Heap for long yet, but I'm already greatly impressed by it. Well, nothing really yet. I'd wish, though, that they had tutorial videos at hand, right inside the dashboard, preferably under each section. They do offer tutorial videos, don't get me wrong, but unless you access them from a newsletter, you need to look for them somewhere on the website or in the dashboard, and I have no clue where to look for them at the moment, to be honest. Well, just give it a try:) You'll be amazed, I'm sure. Finding out who visits our website, how often and what their route is in an easier and faster way than with Google Analytics. We were also looking for a tool that can be easily understood and used by several colleagues, not just the ones who are responsible for analytics. "Best and most user friendly analytics suite"
I especially like visualizer and the funnel feature. Helps me breakdown the conversion of each stage of the funnel and see which channels have the highest conversion. 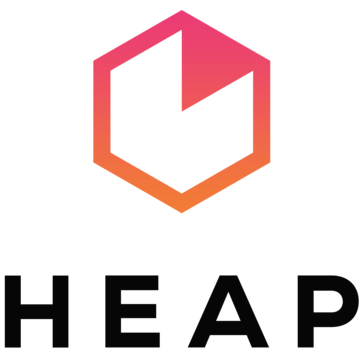 Heap is easy to deploy ,even easier to setup and has a very low learning curve. The reporting interface is great has some really great user experience and is very customization. Switch to heap if you plan to have non-technical staff doing data analytics and pulling reports from your analytics software. "Great for marketing funnel analytics"
I was about to deploy another event-based analytics app when a coworker told me to check out Heap. I set it up quickly and was really surprised at the depth available, and loved the ability to reconfigure events or create them later and still have them populated with historical data. It's now core to how we manage our team and campaigns. Nothing significant. Their support team is usually very responsive, and they have consistently rolled out new features and made them available to us over our six months of usage. They have a generous free tier, so try out a basic implementation and see it for yourself. We primarily use it for marketing analytics through the funnel and into product usage. "Powerful metrics at your finger tips"
Heap's ability to quickly create events without legacy tracking, then using those events in funnels and/or graphs to get a true understanding what your customers are doing within the app are essential to good development. That I can't graph or funnels events with relative dates. Say user signs up and does things within 30 days of signing up. Use it. It is simple and effective. It will take some time to truly get the benefit of the data as analytics does take some finesse but Heap is there as the perfect side kick. Easy to implement, compared to other solutions. Time-consuming to set up specific events and segments. No royalty for their long-standing customers. After been with them for 3 years, we decided to leave after they demanded to either increase our monthly subscription because of a change to they plans structure (an increase of over $500 with no added benefits) or to cancel our membership. "Very good insight in how users behave inside your application"
Creating funnels, seeing where users drop-out. Creating custom events. At least in the beginning you could not (as a user) participate to multiple projects with the same email address. We use it to track customer behaviour in an HTML5 webapp where users can buy roadside assistance. Thanks to the data in heap we managed to improve multiple times our app leading to better sales. By comparing week by week the same sales funnel you can track and measure your progress. Custom events are powerfull and also allow to send custom data. Really like the blend between simplicity and power. If you're stuck using Google Analytics this will really help you. As a marketer it's great to not have to ask the dev team to make each new event, I can simply create it in Heap myself. Some better per session analysis would be great, like "What did people who did X in any subsequent session, do in their first session?" If you haven't fullt bought into Mixpanel I can recommend looking into Heap. If you're only using Google Analytics, definitely go for it! Easy to set up and once it's rolling it's a great tool to have. We use it for our SAAS business. "Easy to install and very useful to understand user behavior"
The best thing about heap was, it was very easy to setup. We are an early stage SAAS product and it is very important for us to understand user behavior and conversion funnels. Heap lets us track all of that without having to set up a lot of events individually. Can't say I dislike, but I would like to see some best practices to be able to track metrics. I am not sure, how easy it would be to visualize this data as our numbers grow and in terms of understanding a cumulative behavior. It would also be nice, when i login to the app to show some default reports, which will also help me understand the power of the product. We are an early stage SAAS product (www.zipboard.co) with customers worldwide. At any stage of your product, it is important to understand where your users are clicking, scrolling, converting or bouncing off. Heap lets us do all of that. It lets us validate some of our workflows etc by watching the user behavior etc. "Seamless and easy to use"
A seamless 5min instalation and the track everything apporach leaves me with great peace of mind that Im not missing anything! They do offer a free tier, which can go up to 50k sessions if you put their badge on your site. However, as long as you pass this threshold, the minimum plan is 15k a year which is quite steep rise for us. At thils level, we could only add heap to some of our pages. If they had more gradual pricing, we would for sure consider using them for other pages. Using heap eill make your analysis simple and fast. Having worked previsouly with traditional analytics platforms like flurry and ga, I know one the hardest things is to have to define upfront the events you want to track only to later find out that you should have tracked sthg else along to hve a good insightful and actionable diagnosis. Heap lets me find out those caveats without too much thought at the beggining. "Super easy to setup and use. Responsive team makes up for occasional bugs. " Going from 0 to 1 is incredibly easy. As a mildly technical product manager, I was able to get heap running in minutes and tracking most of what we cared about in a few hours. Additionally, their free plan is very generous which has helped us (a young startup) get off the ground and experiment. There are occasional issues with how Heap creates, identifies, and tracks user sessions. In a few instances, these were a major problem, but the heap team was very responsive and able to get us what we needed in those cases. Day to day, we accept that heap's numbers are fuzzing about 3-5% of our user sessions (calling one user two or missing a session). This does mean that we can't use heap for very fine grain analysis, but we still trust it for general trends, user numbers, and picking apart individual user sessions. The biggest benefit was testing the conversion rate of our early sign up flows and optimizing the different screens we present to users. We've also used it for ad words tracking, minor system health monitoring (by way of tracking user facing error screens), and for identifying sticking points in our user experience. "Crucial insights for a small product which got an unexpected 50k uniques in a day"
The fact that it track all actions done by an user is huge. A lot of the times you have no idea, ahead of the time, of what you want to track. We found out a lot of details about our users, even days after they visited the site, based on queries we thought about later. It could be a bit more user friendly in terms of presentation, a lot of the features are a bit hard to find, and a lot of the options in the left-hand side soudn the same. Be prepared to spend some time to understand everything in the UX, if you're not a pure digital marketing person. "Heap - Easy way to track your analytics"
Heap is better at giving you a fast experience at Analytics. While Mixpanel you have to track all parts of the System that you want to track, Heap gives us a automatic capture. Also the layout is pretty, and uses graphs to show some detailhs. Give it a try if you can, we had to decide faster and that is why we used Mixpanel. I am solving trying to detect what a user do in my application, so I need ways to get some info. Retroactive analysis with no tracking code implemented! We had situations when we had a question in mind, but only found that we didn't track that key piece of data to answer the question. Heap is here to solve the issue. 1. Our app iterates rapidly and we need to redefine some events in heap every time, because our component moved around. I almost feel like the time we saved on implementing the tracking code is the spending here redefining the events. 2. Became pricy when you ask for data export. Retroactive analysis with no tracking code implemented! But the truth is when our app changed we need to redefine some of the events. I suggest use the GA or whatever as the main tracking, while keep Heap as back up when you need some retroactive analysis. Heap also becomes expensive when you ask for data exporting. Retroactive analysis! We had situations when we had a question in mind, but only found that we didn't track that key piece of data to answer the question. Heap is here to solve the issue. "Its a great tool for quick analytics across the firm!" Ease of usage and excellent support! Also, they have been building some cool features which further adds up to our use case specifically as we are a B2B company. Nothing really. They could possibly add some more advanced funnels and path analysis to better up their UI. Also, it would be useful to have Heap SQL as a part of the UI where all SQL files could be stored and shared across the team, and the code be run on the UI! I think it's a great tool to democratize analytics across the board! High speed product analytics at scale across the company and then easy sharing of results! "The analytics platform that helps you dive deep into your data"
Being able to use the event visualizer, set up funnels, and work with a fantastic team makes Heap Analytics the full package. Going from a more basic analytics tool to Heap changed the way I analyze data and make decisions. I wish they had a HubSpot integration, but I know that is coming soon. We're able to now make data-backed decisions on ways to improve our website.